Stamp with Melva: It's been awhile...but we're "Humming Along"
Christmas is over and we wait for the new year to begin. I haven't posted since December 18th. 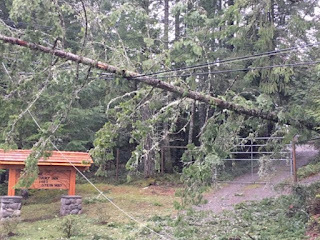 I had the best of intentions last week to get my blog post ready and then on Thursday, the West Coast of British Columbia had an unbelievable windstorm. 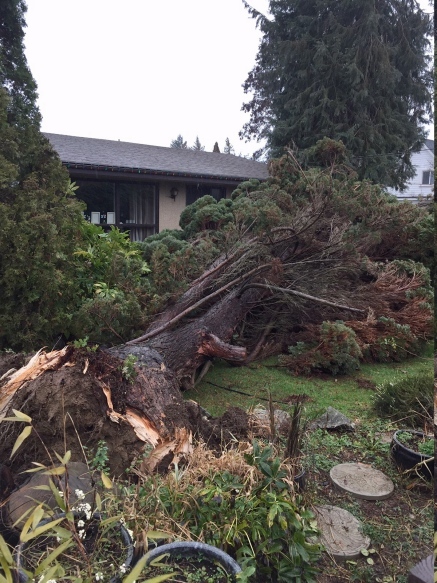 Wind gusts of over 100 km per hour on parts of Vancouver Island. 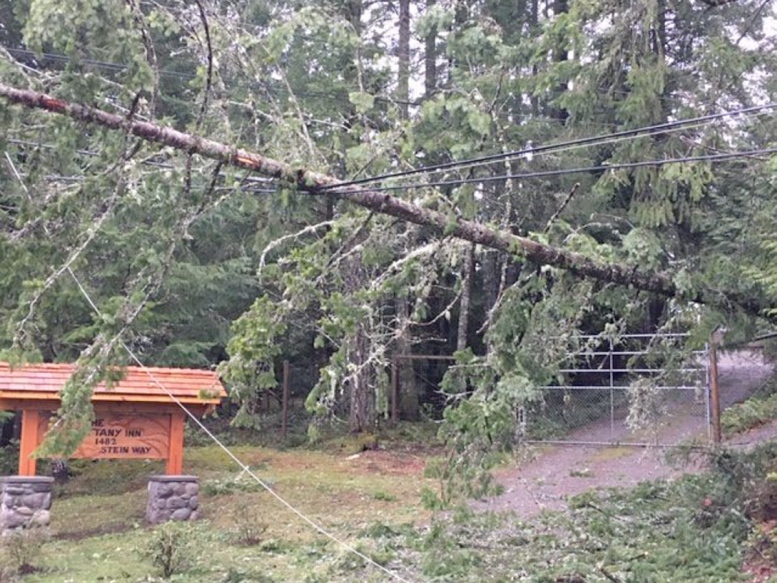 Trees down, power line down! I was out about noon on Thursday to pick up my husband. I could see the debris on my way there but luckily there were no trees blocking my way. I the space of 10 minutes as I waited for him to pack up, two trees came down and blocked our road out. We had to take the long way home. Thankfully a man in a truck was ahead of me and every so often he would stop and clear a branch out of our way. It was definitely scary! Our power went out early afternoon on Thursday and didn't come on for 29 hours. 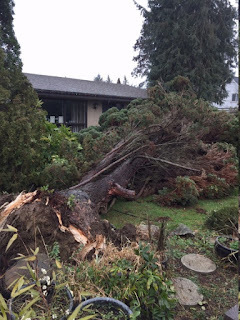 We actually were one of the lucky ones - some people in the area just go their power back on Christmas Eve. This taught me a valuable lesson - not only to be prepared with blog posts and not to leave them to the last minute. More importantly it reminded me of the importance of an emergency kit with flashlights and candles and other supplies. Here are a couple of images of the damage. This is not my house! Now that we're back to normal, I've been playing with all of the new products in the Occasions Catalogue. Today's card features the Humming Along stampset. Dale Hampshire did an amazing job demonstrating this stamp set at OnStage in Orlando. 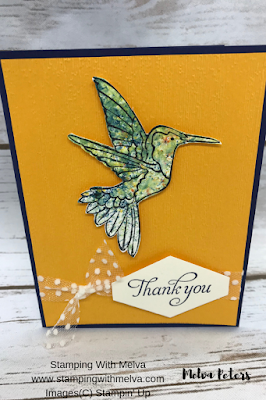 I loved how he used the Brusho Crystals to colour in the hummingbird on his card, so I tried the same on this one. We're lucky to have hummingbirds on the West Coast all year round. I was walking by a neighbours the other day and at first I could only hear it - the wings are moving so fast, they make a noise! Then I noticed him trying to get something out of the feeder. Amazing! Score Night of Navy Cardstock (5 1/2" x 8 1/2") in half to make card base. Emboss a piece of Mango Melody Cardstock (4" x 5 1/4") using Subtle Embossing Folder. Sprinkle a small amount of Yellow Brusho crystals on humming bird and then a very small amount of Prussian Blue. Spray gently with water and let the magic happen! Adhere to Mango Melody Cardstock using Dimensionals. Tie a piece of Polka Dot Tulle around card from and time a knot. Reserve now by emailing me at stampinwithmelva@gmail.com. I will send you an invoice on December 28, 2018. You can pay by e-transfer or credit card by January 2, 2019. You product will be shipped mid January.